Our himalayan pine bath has been prepared for all who need intense refreshment during a bath.We composed it with valued for centuries natural plant ingredients that nourish and refresh the skin, making it radiant. The thick, fluffy foam and the fresh aroma make the bath a unique experience. Creating this formula, we used all of our experience and rich herbiculture traditions, so we are confident about the results. 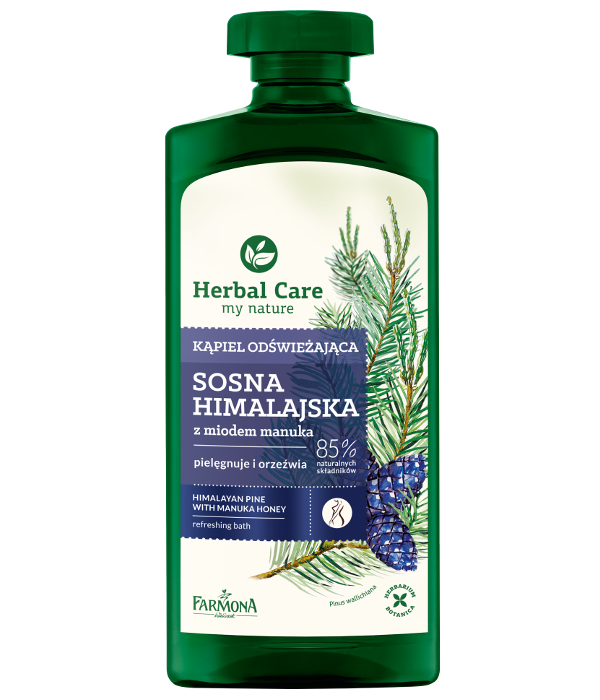 pine oil refreshes, energizes, eliminates tiredness and improves mood. manuka honey accelerates the regeneration of the epidermis and assists its recovery. oat milk nourishes, visibly smoothes and takes care of the skin. Aqua (Water), Sodium Laureth Sulfate, Glycerin, Cocamidopropyl Betaine, Polyquaternium-7, PEG-7 Glyceryl Cocoate, Sodium Chloride, Coco-Glucoside, Glyceryl Oleate, Mel Extract, Panthenol, Pinus Sylvestris (Pine) Oil, Avena Sativa Kernel Extract, PEG-60 Hydrogenated Castor Oil, Helianthus Annuus (Sunflower) Seed Oil, Rosmarinus Officinalis (Rosemary) Leaf Extract, Potassium Sorbate, Sodium Benzoate, Polysorbate 20, Cocamide DEA, Citric Acid, Caramel, Disodium EDTA, Parfum (Fragrance), Eugenol, Limonene, Linalool.